Huge Savings Item! 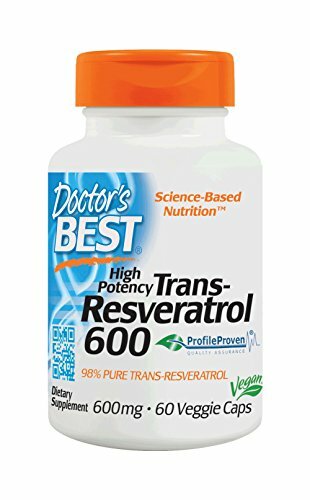 Save 12% on the Doctor's Best Trans-Resveratrol 600, Non-GMO, Vegan, Gluten Free, Soy Free, 600 mg, 60 Veggie Caps by Doctor's Best at Maximum Wellness. MPN: DRB-00416. Hurry! Limited time offer. Offer valid only while supplies last. Trans-resveratrol 600 provides highly concentrated levels of trans-resveratrol from the root of the Japanese knotweed (polygonum cuspidatum). Trans-resveratrol 600 provides highly concentrated levels of trans-resveratrol from the root of the Japanese knotweed (polygonum cuspidatum). Japanese knotweed provides one of the highest resveratrol concentrations found in nature. Resveratrol exists in both trans-and cis-forms. However, published research suggests that only thetrans-form has valuable biological activity. If you have any questions about this product by Doctor's Best, contact us by completing and submitting the form below. If you are looking for a specif part number, please include it with your message.